HOT SPRINGS, Ark. 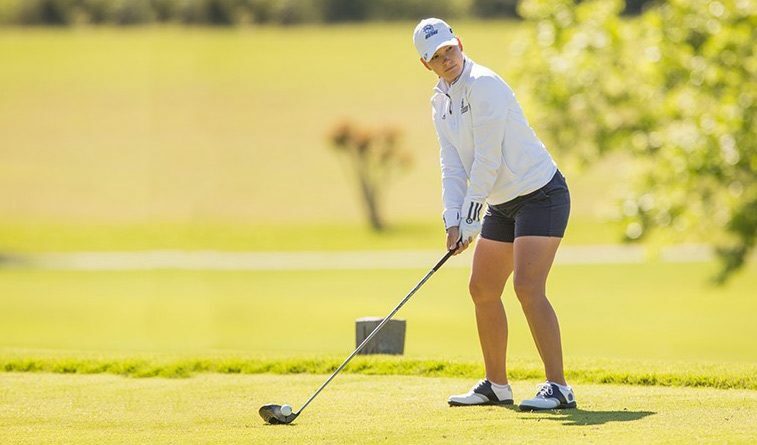 – SWOSU sophomore and First Team All-Great American Conference selection Elin Wahlin put together another strong performance on Tuesday, shooting a two-over 74 to win the 2017 Great American Conference Championship by three strokes over Caroline Fredensborg of Arkansas Tech. In the process, Wahlin helped the Lady Bulldogs to a third-place team finish, the same place they’ve now finished in all six GAC Championships. Wahlin, who finished as the co-champion at the GAC Championship in 2016 as a freshman, shot par on five of the first six holes then went bogey, birdie, bogey on the seventh, eighth and ninth holes to go to the back nine 2 over. Birdies on number 10 and 14 got her back to even par and built a five-shot lead heading into the final two holes, allowing her to be cautious and get the win despite bogeys on 17 and 18. Wahlin earns her first conference championship after losing top honors last season in a playoff. Behind Wahlin, the Lady Bulldogs also got a top-five performance from GAC Player of the Year Gloria Choi, who tied for fifth place after shooting a 78 on Tuesday. Emily Folsom fired a 79 in the final round to finish tied for 13th while Jenna Eidem dropped back to 15th after an 82 in her final round. Chloe Thackeray rounded out the team with an 83 on Tuesday as she finished 30th at the tournament. The Lady Bulldogs now turn their attention to the NCAA Division II Central Region Championships, which will be played on May 8-10 in Sioux Falls, South Dakota. Southern Nazarene closed out its 2016-17 season with a seventh place finish at 999 three-round total after a 334 in the final round. Emilee White played her last round for the Crimson Storm Tuesday, and shot an 82 that was good enough for a tie for 24th with a 246 total. Heidi Stafford also finished with a 246 total, as she carded a final round 85. Cassidy Herbster also played her last round as a member for SNU, as she shot 85 and tied for 35th place with a 259 tournament total. Sarah Rovenstine finished tied for 37th with her final round 86 and 260 total. After having to withdraw in the second round, Bailey Blake came back on the final day to shoot an 82 for the Storm. She finished in 45thplace. HOT SPRINGS, Ark. – Despite shooting their highest score of the week, the SWOSU Men’s Golf team moved up into sole possession of third place at the 2017 Great American Conference Championships, which concluded Tuesday in Hot Springs. Bulldog freshman Kason Cook led the way for SWOSU, shooting even par of 72 in the final round to finish two-over for the Championships and earn a Top-10 finish as he ended tied for seventh place. GAC Player of the Year Stefan Idstam had his highest score of the week with a 78 in the final round and he finished tied for 15th. Seth Overstreet shot his third straight round in the 70’s with a 75 in the final round to finish tied for 24th while Marques Gomez struggled on Tuesday and fell to 34th place after carding an 84. Ole Hatlelid stayed consistent, firing his third straight round of 80, which placed him 44th overall at the tournament. Henderson State won the tournament by four strokes over Arkansas Tech, with the Reddies led by individual medalist Nick Shapiro. SWOSU Men’s Golf now sets their sits on NCAA postseason play, which will take them to Axtell, Neb., on May 8-10 for the Central/Midwest Super Regional Championships.